Tidy Tips a SW american desert daisy that puts on massive displays in famous high rainfall years. In our climate this hardy annual continues blooming for months as our cool summer nights seem to trick into an eternal spring. 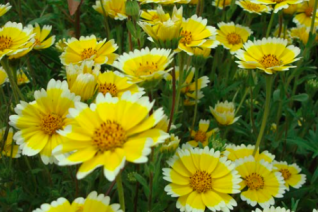 To 10″ tall forming a spreading plant in full sun and rich to average, well drained soil. Good drainage assists it in setting seed and that seed over wintering for germination the following spring. Remove spent flowers to spur more. Light consistent summer water. Otherwise let it go to seed. Nice cut flower. Loved by butterflies. Easy to save seed and toss out in spring in open sites after all threat of frost has passed.